Instant messenger services are more popular than ever and over the past couple of years I’ve been able to get around to reviewing a handful of them.These applications offer a free and convenient way for Internet users to chat one another, usually through simple text dialogue. Unfortunately there are many several different products on the market and the likelihood of everyone you know using the same one is quite remote which tends to result in some people juggling their contacts between two or more different systems.It is precisely this reason that I have chosen today to look at a piece of software which aims to bridge the gap between these different applications. ‘Trillian’ has been around for around many years now when the initial release became available to the public back in mid 2000 although at this time it was a simple IRC (Internet Relay Chat) client.It wasn’t until the end of 2000 that the application took a pretty major change in direction by becoming compatible with existing applications such as MSN Messenger, ICQ and AOL Instant Messenger and this is when its popularity started to soar.It is worthwhile noting that throughout the evolution of this program IRC support has been maintained. Trillian makes life easy because once you’ve downloaded the free software and set-up all your Instant Messaging user names and passwords then you need only ever use one application.From this point whenever you load the Trillian application it will instantly sign you in to all of your IM accounts simultaneously so you can talk to your contacts irrespective of which program they use. The basic version of the application is around 8.5mb in size and as well as being completely free of charge doesn’t contain any adware or spyware.The company generates income by relying on those users that need some more advanced features upgrading to the professional version at a cost of around £15.The professional version does add many important features such as video calling and the ability to install plug-ins (addition features developed separately from the main application) but I’ll stay focussing on the free version of the software for the purposes of this review. As well as making life more convenient this application is also popular because it contains some pretty advanced features such as tabbed messaging, changeable skins, emoticons and audio chat.A handy feature is the instant lookup tool which allows you to immediately look up any word present in a conversation window with the online Wikipedia Encyclopaedia or by searching the Internet. 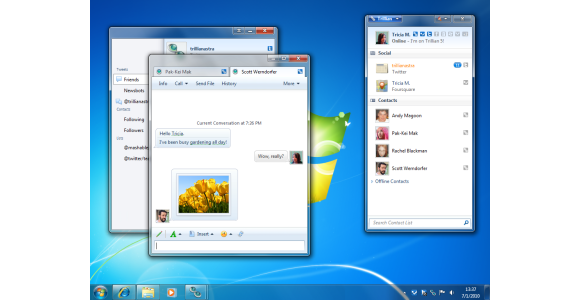 Some users may find that even if they only ever use one instant messaging program that they would rather use Trillian because the user interface is much better than that provided with many of the other IM programs available out there.Whilst all IM programs have features specific to their individual software Trillian has seemed to cover all the important stuff, even in the free version. If instant messaging is your thing then head to www.ceruleanstudios.com and download the application for free.I would really recommend giving this program a chance as I do see too many people trying to juggle their contacts across several different applications and with quality software like this on the market it really isn’t necessary.